Abstract: A3, as the very first type of A-series self-balancing electric scooter, brings brand-new design concept and riding experience to people. It is also the first sitting-posture electric self-balancing scooter, which makes sure more comfortable and safer riding experience. If a consumer plans to buy a type of electric scooter brand, however, he is dissatisfied with the existing models or he is worried about the personal safety or he dislikes riding scooter with standing-posture for a long time. Then, A3, as the first type of A-series self-balancing electric scooter, will solve all of those troubles. Therefore, the demand of long-distance trip within city can’t be satisfied, which is also a short board of self-balancing scooter compared with traditional electric vehicles. The brand-new sitting-posture riding mode ensures more comfortable and safer riding. 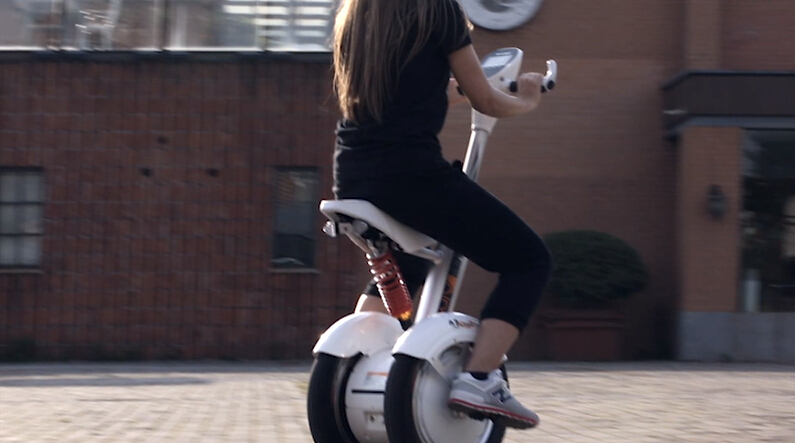 Besides innovative saddle of Airwheel A3, electronic brake system is another shining point. When a rider presses the switch of electronic brake system, the scooter makes a quick and strong brake within 0.5 second. Meanwhile, the stopping distance is no more than 50mm. That is to say, the safety of rider can be protected to the furthest. The improvement of safety lowers down the purchase threshold of the vast number of consumers. The consumer base of A3 will be enlarged in the near future. In order to give riders the nicest travel experience, Airwheel has designed an exclusive APP for A-series. Users can download it from Airwheel official website and install it in the cell phone. Then, users can gain all effective data via APP and know the real-time riding state better. In addition, Airwheel is going to create a whole intelligent ecosystem, which integrates many functions, such as leisure, entertainment, GPS service, emergency aid service, anti-theft and tracking system, or remote control and so on. Why is Airwheel self-balancing A3 scooter the best choice? Because it is good enough. The considerate APP can meet omnibearing needs from users.